As members of Christ's body we edify one another when we share safe, reliable resources for our families and personal studies. Note! These recommendations may not constitute an endorsement of all the views of of those who provide resources. Please inform us if you discover a doctrinal issue which could re-classify a recommendation. We are not remunerated or recognized in any way for any recommendation and we do not solicit free copies of books or materials for evaluation, or sell or distribute them. Christian Radio that you can trust. Download your free app and enjoy music that ministers to the heart. Study God's Word at the level which makes you comfortable with classes ranging from young believer to seminary level. Read the list of Bible Institute contributors and understand why we recommend this site so highly! Recommendation Level: High, normal, restricted. "Visually stunning animations and dramatic footage help to show how the theory’s supposed strengths are, in fact, its fatal flaws--Evolution’s Achilles’ Heels. ​"Like no other work that we are aware of, fifteen Ph.D. scientists collaborated to produce a coordinated, coherent, powerful argument. All of the contributors received their doctorates from similar secular universities as their evolutionary counterparts. Each is a specialist in a field relevant to the subject: Natural selection, origin of life, geology, genetics, radiometric dating, the fossil record, cosmology, and ethics. 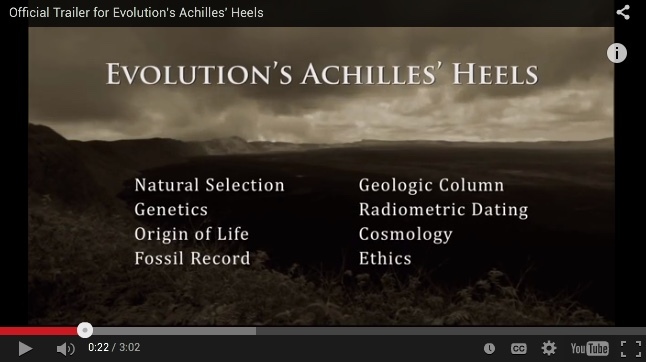 Evolution’s Achilles’ Heels directly demolishes the very pillars of the belief system that underpins our now-secular culture—evolutionary naturalism. It’s coupled with the Biblical command to reach the lost with the Bible’s Good News. In a nutshell, it’s a comprehensive outreach tool like no other."